See all my blog posts on the PCC elections by clicking the PCC label in the tag list on the right, or go to tonyox3.blogspot.co.uk/search/label/PCC. Here’s a very quick chart of the results of the PCC election in the Thames Valley. These figures are now confirmed as final. In the French Presidential elections you get to vote twice, but you only cast your second vote once the top two candidates from the first round have been declared and go forward to the final two weeks later. In the PCC elections on Thursday you have to choose who (if anyone) gets your second vote before you know who the top two candidates are. I’ve been thinking about how you choose your second vote. Is there any case for tactical voting or should you just vote for your second favourite? Probably the latter but not necessarily, I suggest. 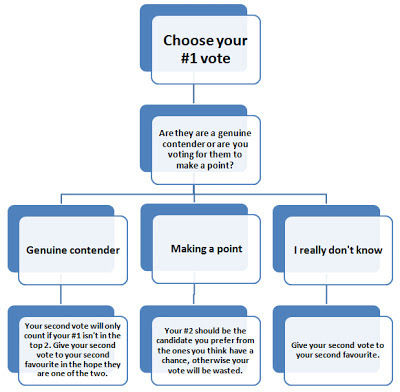 If you need a reminder of how the voting system works, see here under ‘Voting Procedure’. The problem is we have virtually no idea how the voting will go in this election. There’s no history and very little demographic analysis. In the Thames Valley you might think the six candidates form three natural pairings, Con/UKIP, Labour/LibDem, and the two Independents, any or all of which could split their supporters’ votes. If the turnout is as low as expected you might also think that those who do turn out will tend to vote along party loyalty lines, which would favour the three main parties. But in our case Barry Cooper of UKIP has mounted a strong campaign and could take votes from Conservative and disillusioned LibDem supporters. The two Independent candidates may well benefit from the popular line of keeping party politics out of this election. So I think we can’t rule out a situation where after the first preference votes are counted most or even all the candidates are fairly close together. If this happens the top two candidates could be any of the six and the final outcome almost random. Does this affect how you should choose your second preference? I think the answer is generally ‘No’ – you should choose your second preference as the candidate you would like to see as PCC if your first choice isn’t elected. A situation I can see where this isn’t true is if your first vote is going to a candidate who you don’t think has a chance but for whom you want to vote anyway to make a point. In that case you can either not give a second choice (it’s not compulsory) or if you don’t want to waste your second vote you should give it to the candidate you rate “least-worst” of the ones you think may be top runners. This might not be your actual second choice preference, but to vote for two no-chancers (as you see them) is a waste of time because your second vote won’t be allocated to one of the top two so won’t be counted. Even so, given the uncertainties and with the best will in the world anyone may end up with their number one choice not being in the top two and their second vote not being counted because it’s not for one of the top two either. But hey, folks, whatever happens turn out and vote on Thursday! Let’s get Thames Valley confounding the doomsayers with a turnout well above the national average! In a reply to @RubyMalvolio’s comment on my previous post I said that turnout next Thursday might – just might – surprise us by being as high as 25%. That set me looking for other forecasts, and I found this from yesterday on the authoritative politicalbetting.com website. It seems there’s not much betting interest in the election: none at all for the candidates, only for the turnout. Ladbrokes were offering odds of 5/6 on a (national) turnout of both more and less than 17.5%; Bet Victor had 8/11 for higher than the same figure, evens for lower. Bet Victor’s odds had shaded marginally today towards the lower range at 4/5 and 10/11 respectively, still centred on 17.5%. What the bookies seem to be saying is “we reckon turnout will be 17.5% but we really don’t know if it’ll be higher or lower than that”. If the odds were better I might back my hunch, but at 4/5 I’ll save my cash! 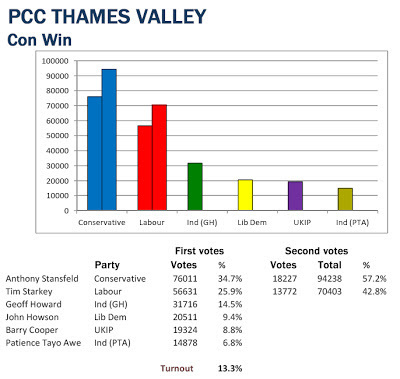 Update: Just to clarify, my hunch about higher turnout only relates to Thames Valley. I haven’t been following campaigns in the rest of the country.